congressional system | Notes from the U.K.
One of the strange things about the British parliamentary system—at least to this American, raised as I was on the fixed-term congressional system—is that the prime minister can call an election whenever the mood takes her, as Theresa May recently did. She and her husband were out walking in the wilds of I forget where and—never mind that she promised that she wouldn’t do this—she decided to call a snap election. Quick, while her party was well ahead in the polls. This election was so snap that none of the parties—including hers—had a manifesto ready, which voters here think of as a necessity. Now manifestos are new to me. Sort of. The only one I ever heard of before I moved here was the Communist Manifesto, so I just assumed the word had a heavily leftwing slant. But no, they’re mainstream as hell here. Every party—right, left, and center—puts one together to let voters know what they’ll do if they’re elected. This actually matters because the leader of the party that has a majority in Parliament gets to be prime minister and therefore, at least in theory, has the power to deliver on the party’s promises. If, of course, any one party has a majority, which is by no means guaranteed. Is this couple (not quite) holding hands and walking into the sea to avoid election news? Nah. They have a dog with them. They wouldn’t do that. 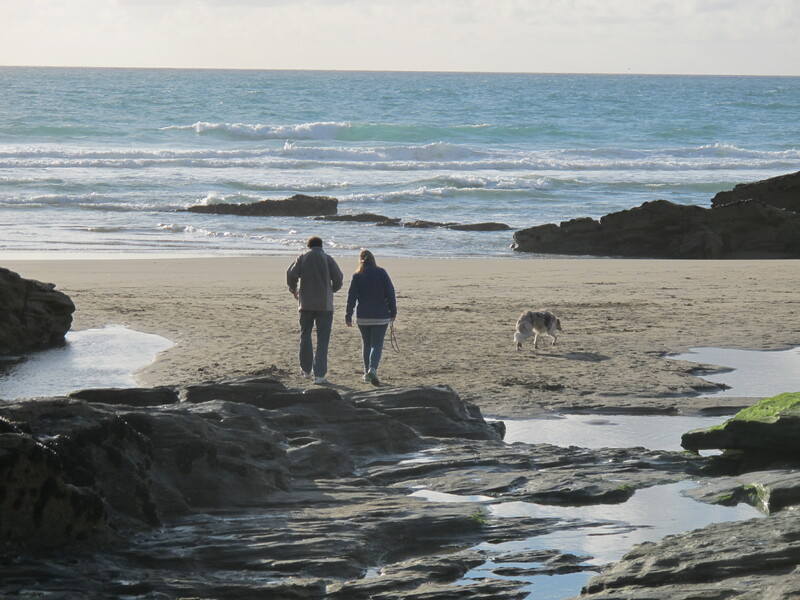 It’s just a quiet day at the beach in Cornwall, with people wearing street clothes and jackets. The photo is, as usual, completely irrelevant. In 2010, the Liberal Democrats’ manifesto promised free university tuition, which they argued would be fairer to students. Then after the elections, they went into coalition with the Conservatives and ended up not only dumping the promise but tripling tuition—which they now argue was fairer to students. They’re still trying to live that one down. Neither the Lib Dem or the Conservative manifesto from that election said they’d reorganize the NHS—in fact, the Conservatives promised no more top-down reorganizations. Then they reorganized the NHS. So you can see, these manifestos carry a lot of weight. Still, people read them and consider them some sort of guide to what a party intends. But getting elected in the U.S. doesn’t guarantee the power to do anything, so they have a perfect excuse. All of this may be why American elections are so focused on personality. Or it may not. I’m guessing. Once the election was announced, the pollsters scrambled and consulted the chicken entrails and reported that the Conservatives were on track to win a huge victory. The parties scrambled and eventually, after a leak or two, got their manifestos out. The Conservatives got a faceful of opposition to one of their proposals and announced that they didn’t really mean that one. The pollsters checked the entrails of a different chicken and reported that Labour, which went into the campaign so divided that it looked like a Civil War re-enactment club, was closing the gap. More chickens were sacrificed. The results all contradicted each other and still do, but the Conservatives’ comfortable lead no longer looks comfortable. Here in the Southwest, the chickens all moved north and east, and very wise they were, too. As a result, the June 1 Western Morning News, making a heroic effort to report on the local campaigns, was reduced to quoting the betting odds, which had the Lib Dems are favored to retake two seats they lost to the Conservatives in the last election by 7 to 2 in one district and 4 to 1 in another. It’s been an interesting campaign. We vote on June 8, after which the chickens can all come home to roost.